This month's New Moon in Gemini Spotlight is on Spiritual Healer Tiffany Wilson who just happens to have Gemini Rising. Your Rising Sign or Ascendant describes your outward personality, kinda like a business card. It also describes how you initially approach things. 1. What originally got you started as a spiritual healer? It was the realization that I had already been doing spiritual healing for all of my friends and family because it just came naturally for me. From a very early age in life I realized that I could see certain things about people that they couldn't see in themselves, and with deep empathy communicate this to them in just the right way. It was natural for me to take up tarot as a tool for aiding seekers, including myself, in seeing life and healing from a different perspective. Connecting with people in great depth and watching them as they meet themselves through flashes of insight and intuitive inspiration. Those moments are what make my heart overflow. 3. Spiritually, who has inspired you the most, and why? Elle North from Drawing Within was my first exposure to learning about reading tarot. Once I discovered that her teaching style spoke to my soul, I was anxious to take more of her classes. When I learned to reconnect and trust in my intuition, I was able to amplify that with others. Another person of great interest to me is Madame Helena P. Blavatsky. She was a psychic medium and a pioneer of the occult, not to mention way ahead of her time. Although she was considered an outcast, she was comfortable enough with herself and her experiences to continue her life’s work. To me this is a symbol of her integrity and dedication to bringing the messages she did to the world. I find this so very inspiring. 4. How did you decide what specialty to focus on as an intuitive? I found myself being pulled toward what came most naturally to me. This wasn’t really a conscious decision, so much as a surrender to what the universe was calling for me to do. I followed my intuition. There was a class for tarot (with Elle) offered in my Facebook feed and deep down inside I knew it was something I desired to do. At that time I didn’t realize how it could be used as a tool for healing myself and others. 5. How does your Rising Sign (Gemini) influence your work? Being a Gemini Ascendant allows me to take my gifts into a social setting and tempers my introverted nature. My powers of observation are keen and I am constantly mentally active, which means that I have a lot to say and many ways in which to say it. It is easy for me to create an analogy with which to gain the understanding of a client. 6. If you had to choose a spirit animal to describe yourself, what would you choose and why? My spirit animal is the hawk. The hawk is known for having powerful vision and for flying very high above the earth in the sky. This allows the hawk to see things other people and animals cannot see. Also, it is a bird of prey, which is a symbol for leadership and intellectual action. Hawk is connected with the air signs and spiritually symbolizes intuition, which is my greatest tool. 7. What advice do you have for others who are just starting to develop their intuitive, healing side? Focus on what your intuition tells you about everything. Journal about unexplainable moments where you just simply know things, and were right. Give your intuition the credit it deserves. Meditate daily to connect with your intuition. Use the power of knowing to help others know themselves in a loving and medicinal way. Show others how to connect with their intuition. Take classes that teach you different ways to connect with, or deepen your connection with your intuition. I have created space in my spirit for whatever the universe decides I need to be involved in. I plan on learning more about developing my business and strengthening my knowledge of tarot. 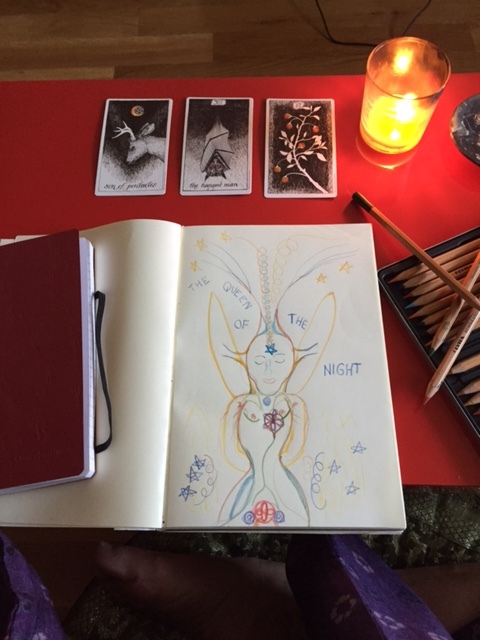 Ultimately, I would love to be a creator of my own tarot deck, just like you! Hi there , I'm Tiffany Wilson and I'm here to bring out the beauty and strength in all I come into contact with. By pushing past my perceived limitations in all I do, I show others what it is to be who they really are. I live a life of passion and in everything I love, my originality is showcased. Meditations, hot baths and all things in nature bring me comfort. I love listening to philosophy, records and podcasts. I fancy myself crafty, enjoy exploring the depth in all things and take wayward pleasure in exploring the occult with all of its mysteries. Intimate conversations and deeply rooted moments of silence are ways to my heart and writing and journaling bring a smile. If you walk away from an experience with me feeling better about yourself, then I've done my job. I look forward to meeting as many of you as I can as not only are things I have listed here passions of mine, but so are you. Affirmation: Shush! I quiet my outsides so my inner voice can be heard. When you pull this card in a reading it’s definitely not a time to charge forward. You need to lay low and take care of yourself right now. Self care is number one so find a way to nurture yourself body, mind and soul. You deserve it. In my own life when I painted this card I actually had a cold and was feeling very inward, needing time to recover and take care of myself first. What feeds you? What keeps you going and fulfills you? Is this a part of your daily work or play or even your dreams at night? Quick, the fairies are calling you; can you see that flash of light, that wee sprite, out of the corner of your eye? She is calling your name. You are the mummy now; the mummy of your own inner dreams. Take time out to acknowledge yourself. Wrap yourself up like a mummy, in protective layers so that YOU, yes YOU can hear your own thoughts without distraction. Allow the Divine to speak through you, trusting that the advice she has for you is going to be good for all of us. Allow the group mind, the myriad of voices, the universal, co-creative, collective consciousness to speak through you by listening to your heart and soul. Allow this energy to fill your soul with light for you are love and all you touch is loved. To feel love is pure warmth, wholeness, open-ness, selfless-ness, shameless, guiltless joy – that is love. I enjoy collecting materials for making art. I have a large collection of books and magazines that I source images from to create collages. I am always on the look out for 2nd hand illustrated books at markets and charity shops. I used to create assemblages, but gave it up during a major de-cluttering phase, because I didn’t want to hoard objects anymore (still a work in progress). 2.What originally got you started creating your art or craft? During Art School I started creating collages in books. I was using collage to express and process different emotions and states of being. Collage allowed me to develop my own personal, secret and symbolic language. It was like writing in a diary using encrypted code and I was the only one who knew how to decipher the code (a psychologist may dispute that!) As I have matured my collages have become less about my own personal awareness and healing and more about the transpersonal. My mother was always creating when I was growing up, including costume designing, pottery, tiling, landscaping, gardening and painting…so she is my primary creative influencer. As a young adult I was drawn to sacred art including Tibetan Buddhist, Native American and Mayan art. I love vibrant colors and geometry, New Zealand abstract painters Gretchen Albrecht and Max Gimblet particularly inspire me. I love the ephemeral land art of Andy Goldsworthy and the beautiful film work of cinemaphotographer Ron Fricke. At Art School I majored in printmaking and photography, however by the time I graduated I was using collage more than any other process. One of the reasons I continued to work with collage is because it’s so cheap and accessible, I don’t need film, chemicals, ink, a printing press or darkroom to create work, I just need scissors and glue. Collage is also a very meditative process. I can let go of technical concerns and just get lost in the process. I can let the left-brain have a rest and let my intuition take charge of the process. Feeling and observing my response to the colors and images guides the process. After a few hours of creating I tend to enter an altered state, which enables me to gain insights and make connections. Collage allows me to create a bridge between the conscious mind and the unconscious. It can be a very powerful healing process, if I allow myself to let go into the process. I have four planets in Pisces (Sun, Moon, Mercury, Venus) and I think this is reflected in my artwork through my use of symbols, the language of the unconscious. My artworks are often surreal and dream like. My artwork has a strong transpersonal focus and I’m interested in promoting individual and collective harmony, healing and transformation. Through symbols and the language of the soul I am striving to touch the essence of the viewer, invoking balance, integration and wholeness. I appreciate the Piscean gift of vivid and rich imagination. I find the escapist tendencies of the fish and it’s urge to dive deep under the water a challenge to navigate at times. The beauty and healing power of nature. A dragon fruit, because it’s bright, exotic and mysterious. I have been collecting beads and gem stones for a few years and I have a jewelry project waiting in the wings. I intend to make three medicine necklaces related to the Medicine Woman Apprenticeship I have been involved with over the past few years. I’ve also been thinking about making short films for a quite a while, using images, color, geometry and sound to take the viewer on a meditative healing journey. One of the biggest thrills for me in sharing my Lefty art in-progress on Instagram is inspiring others to paint their own 'leftys' or non-dominant hand drawings and stories which is exactly what Christine, today's featured Creative Soul has done. Your paintings are inspiring and it's been so healing for me to be with my lefty's. After meditation I always journal and now I like to play for a bit. Left hand only inspired by LeftyCrab aka Kathy Crabbe (see below). A mixologist of herbs, earth, seasons, flavor and life. I have been a practitioner and student of the healing arts for over 25 years. Over the last 20 years I have guided people on their own journey toward well being through the arts of hatha yoga, conscious eating and bodywork. These days I like to play in the big pool of the unknown and each dayhold space for myself and those who work with me to dive into that potential. This self-directed 52-week art journaling exercise will help you develop the routines of capturing your creative thoughts and being artful on a regular basis. This exercise will lead you to slowly but surely accomplish some exciting things. As Steven Pressfield says in his book, DO THE WORK, “Start before you are ready” …you won’t be sorry. Steinbeck believed…”habit seems to be a much stronger force than either willpower or inspiration." Kathy Crabbe is an artist and energy reader living in sunny SoCal with her husband and pet muse, Abby the shaggy black dog in an adobe home they built themselves. so please join the fun! What aspect of creating your art do you find the most enjoyable? The design and execution of my art is the most enjoyable to me … especially stitching! What originally got you started? I went to Art School after high school, but although I knew I wanted to be an artist, I hadn’t found a medium I ‘clicked’ with. It was only afterwards that I was inspired by the designs of Kaffe Fassett, and realized that needlepoint was the medium that suited me. Who has inspired you the most creatively, and why? The aforementioned Kaffe Fassett (www.kaffefassett.com), who is a creative and colour genius! I am also inspired by hearing stories of other artists who have made a living doing what they love. How did you decide what medium to work in? What message, if any, do you want to convey with your art? To be honest, I’ve never really thought about conveying a message at all … I just do what makes me happy, and what is aesthetically pleasing to me. If others love it, then that’s fantastic! I do like to encourage people to learn cross stitch though. If you had to choose a fruit or vegetable to describe yourself, what would you choose and why? If you had to choose one other medium in which to display your creativity, what would that be and why? Woven tapestry! This is what I am studying at the moment (in my second year of a 6 year diploma), and I hope to create one-of-a-kind pieces that complement my needlepoint kits. What advice do you have for others who are just starting to develop creatively? What role does spirituality play in your creative life? An enormous role! My designs are ‘given’ to me by particular entities that want to make themselves known to me. My very first design was Moon Phases, and I did this when I started studying Astrology. Other designs came about after I was ‘visited’ by entities wanting their portraits done … for example, Hathor wouldn’t leave me alone until her design was done. One day I set it aside to do something else, and the whole frame came crashing down (I still don’t know how!). All was well when I started working on it again! 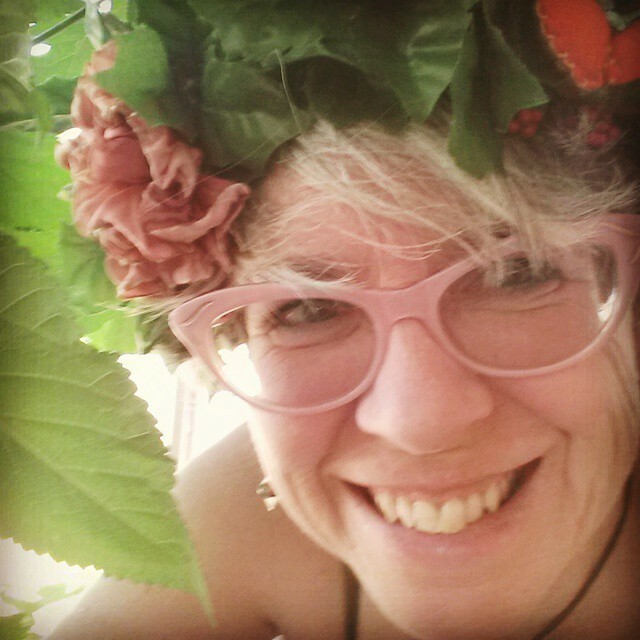 Do you have any business or marketing tips for other artists/crafters? Life is all about doing what makes you feel good! If you are thinking to yourself ‘I’d always like to be trying that’, then get out there and do it – you’re never too old, or not good enough to find your passion in life. Each month in the Creative Soul Circle you'll meet a different guest and have an opportunity to interact with them in person. The Circle also features a Moon Musing Group; a support group for women.